Centre for Information Management | Research seminar: User – Perceived Quality Factors for a Certificated Model of Web – based System. Research seminar: User – Perceived Quality Factors for a Certificated Model of Web – based System. 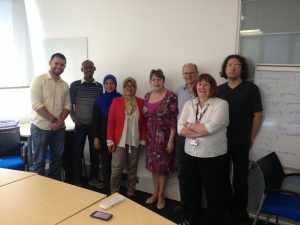 A research seminar was given to today by : Dr.Jamaiah Yahaya, from the Faculty of Information Science and Technology, The National University of Malaysia. Topic: User – Perceived Quality Factors for a Certificated Model of Web – based System. This was attended by both CIM Staff and PhD students. A lively discussion of the topic followed the seminar. Dr.Yahaya is in the centre of the photo in a red jacket, standing next to me. Her colleague Yusamadi- Yah Josh, who is a visiting academic hosted by Ian Murray and me until Nov 2014 is in the blue headscarf.